Review: At the Theater- "Drive" -- This is not an Action film, this is not a "Car" movie- It's a character-driven, slow-burn thriller of the first order that features elements of some of the finer works from Directorial royalty like Martin Scorsese, Michael Mann, William Friedkin, Quentin Tarantino, Walter Hill and the late Sam Peckinpah. The film is an electric mixture of beautiful, lingering cinematography, a pulsating soundtrack, lean dialogue and short bursts of graphic, bloody violence. It's tense and involving- almost impossible not to get immersed in. Nicolas Winding Refn is a Director to definitely keep a tab on. 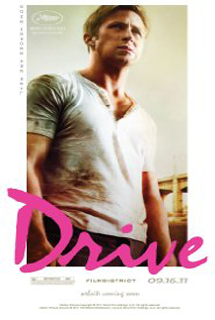 Ryan Gosling is the embodiment of some kind of cold fire at the heart of the matter- his "Driver" character is a well-intentioned but unstoppable force that will surely end up as a cult favorite for decades to come. Carey Mulligan, Albert Brooks, Ron Perlman, Bryan Cranston, Christina Hendricks and Oscar Issac round out an excellent cast that's pretty much in support but extremely well-utilized. Those wanting to check out a quick and disposable, mindlessly fun popcorn flick need to steer clear- this isn't what you're looking for. This is deadly-serious film-making that's damned-near perfect.